The Human Body: Systems Working Together - how long, catch, causes, What Is a System? In recent years, stocks of high-fat fish have been declining in the waters off the west coast of the United States. This has caused the population of seals that eat the fish to decline as well. With fewer seals, the whales that normally feed on them have turned to eating sea otters. As the sea otters have diminished, the sea urchins they normally eat have shot up in numbers, and because sea urchins like kelp, the kelp beds are being decimated. There is more to this story. But the point is to illustrate what we call a system—in this case, an ecosystem. A system is a collection of parts that interact together for a common purpose. But a system is not just any old collection of parts. The parts are related in such a way that each depends on the others to do whatever job there is to be done. No single part can do the job alone, and any malfunction or delay is likely to affect the whole system. A body system is a set of body parts that do a particular task. The human body itself is an example of a complex system—many sets of interacting parts that work to keep the human machine running. On any single day, we can estimate that your heart beats 103,689 times, your blood travels 168,000,000 miles, your digestive system processes 7.8 pounds of waste, and your lungs take in 438 cubic feet of air. These are only a few of the multitude of functions the human body performs. And while the least little mishap could cause a glitch in the system, amazingly, day in and day out over most of our lifetime, our bodies operate almost flawlessly. The basic living unit of the body is the cell. There are about 200 different kinds of cells in our bodies, and about 5 trillion cells overall. Genes, which are inherited from parents, are made of DNA. Short for deoxyribonucleic (de-OK-se-ri-bo-noo-KLE-ik) acid, DNA is the primary material of the cell nucleus. It usually takes the shape of a double helix (a pair of spirals). Imagine it as a flexible ladder that has been twisted into a spiral. The two long edges of the ladder are made of chemical molecules called nucleotides. Each nucleotide includes a chemical called a base. There are four bases that occur in pairs, called base pairs. These are adenine and thymine (A-T) and cytosine and guanine (C-G). The base pairs form the rungs in the ladder, held together by chemical links called hydrogen bonds. If any of the base pairs are missing, out of place or repeated, the defective gene may cause a health problem. Or the defect may have such a minor effect that the person never notices it. DNA sends genetic information through RNA (ribonucleic acid) to manufacture proteins that will build new cells. Proteins are often shaped like a single helix or ring. They are made up of amino acids containing nitrogen, hydrogen, oxygen, and sulfur. Proteins are the building blocks of cell protoplasm, which is the part of the cell that is outside the nucleus. As cells grow and multiply, millions of them together form structures called tissues. Muscles, nerves, and bone are among the different kinds of tissue in the body. Tissue is grouped into organs, such as the heart, liver, and brain, which are masses of tissue that perform specific functions. Organs working together are termed systems: the digestive system, for instance, includes the mouth, esophagus, stomach, intestines, liver, and gall bladder. Systems working together make up the human body. generate electrical signals and carry messages between our brains and our bodies. Epithelial cells are found wherever the body has a covering or lining, for example, the skin, or the wall of the stomach. Other cells called connective-tissue cells connect, anchor, and support the structures of the body. All of this cellular activity is directed by our genes, instructions we inherit from our parents for how our bodies look and everything that they do. Genes do this by coding for the manufacturing of proteins, which are molecules that serve as the building blocks of life. Proteins are so important that everything we can imagine doing—even imagining!—is the result of some 20,000 different kinds of proteins working together. Cells not only specialize, they also begin to migrate throughout the developing body. Small communities of like cells begin to stick together and to make multicellular structures we call tissues. Different kinds of tissues assemble into organs, such as the heart, liver, and brain. An organ is a part of a living thing that performs specific tasks. For example, the heart pumps blood, the liver (which has more than 500 functions) helps get rid of bodily poisons and stores vitamins, and the brain interprets electrical signals and makes decisions about what to do. 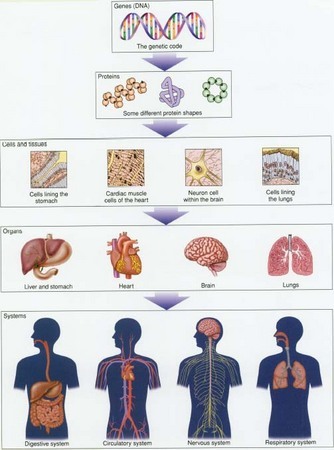 Different organs functioning together are termed systems (or sometimes, organ systems). For example, the respiratory system consists of the nose, pharynx, larynx, trachea, bronchi, and lungs. The parts of the respiratory system work together to take in the oxygen we need to survive, and to get rid of carbon dioxide (waste gas). The circulatory system consists of the heart, blood vessels, and blood. Its purpose is to transport blood containing oxygen and nutrients throughout the body's tissues. Because all of our organs require oxygen to function, the respiratory system depends on the circulatory system to transport the oxygen we breathe to all parts of our body. To some extent, body systems overlap. By that we mean that some organs can be considered part of more than one system. The diaphragm, for example, is a muscle involved in breathing, and it is part of both the musculoskeletal system and the respiratory system. It takes nine months from start to finish to make a human infant. But even after we are born, our bones and brains continue to develop. Other major body changes will occur as we grow into teenagers and then adults, and later in our lives, too, as we experience the process we call aging. Scholars respect ancient Egyptian medicine, which made good use of herbs with medical benefits. The Greeks, the Romans, and Europeans of later eras used and respected several Egyptian prescriptions and tests. This excellent reputation is one reason that the word "chemistry" may derive from "Keni," the ancient name of Egypt. The word "pharmacy" may come from the Egyptian "phrt," meaning "prescription." And the pharmaceutical symbol "Rx" may be derived from the Eye of Horus, the Egyptian god of health, whose parts were used in medical papyri (documents) to indicate drug quantities. Instructions concerning a wound in the top of his eyebrow. If you examine a man having a wound in the top of his eyebrow, penetrating to the bone, you should palpate his wound (and) draw together for him his gash with stitching. You should say concerning him: "One having a wound in his eyebrow. An ailment which I will treat." milk from a woman who has given birth to a boy; to be made into a paste and applied to the outside of the two eyes. Perhaps the physician was treating conjunctivitis. From Civilizations of the Ancient Near East, pp. 1794-1796. New York: Charles Scribner's Sons, 1996.
brain registers the rise in your body temperature, and sends a message to your skin to release the excess heat by sweating. If not for your temperature-control system, the excess heat would cause havoc throughout your body. A control system regulates something or keeps it in balance. The balancing act that those systems perform is called "homeostasis." In the same way that a thermostat acts to keep a house in temperature balance no matter what the weather is outside, so your body maintains physical and chemical settings to keep your cells, tissues, organs, and organ systems working smoothly. Glucose (sugar), for example, is the major fuel that drives the engine of life. Glucose taken up by cells provides energy for the body's cells to perform their different tasks. But too much or too little sugar in the blood can make us ill or even kill us. We need calcium and iron, too, but too much is poisonous to our system. Homeostasis is a process of keeping the body in a state of balance. When the system fails, the result is abnormal functioning, which can result in disease or death. In carrying out our own vital activities, our bodies generate waste products. Our body's ability to get rid of these waste products is also part of its control system. When we are young, we often are in a hurry to grow up because of the freedom to choose, which we like to think comes with being an adult. It may be hard to imagine that our bodies will ever be any different from what they are now. Yet just as the human organism grows from a single cell to a fully functioning person, over time it also begins to wear out or to malfunction—sometimes slowly, sometimes rapidly. One of the marvels of the human machinery is how rarely anything goes seriously wrong, and how good the body is at repairing and defending itself. But sometimes the magnitude of an injury or the cleverness or ferocity of a microbial invader is so great that the body is simply overwhelmed. In other cases, just as with nonliving machines, the body or a part of it breaks down because of age or malfunctions from other causes. The title of this encyclopedia is Human Diseases and Conditions. What do those words mean, and how did we decide which ones to include in the encyclopedia? There is no strict definition of what a disease is, but we can understand a disease as a process that interferes with a structure or function of the body, or as something that causes a change from good health. The word "disease" sounds serious. In fact, most people reserve the term to mean a relatively serious process that may get worse or progress—for example, plague or lung cancer. For mild or temporary changes, such as a cold or flu, we generally use the term "illness." And when something is relatively serious but probably will not get worse, like a broken bone or cerebral palsy, we call it a "condition." As you can see, these terms and the disorders they represent can overlap. A person changes through the days and years. When we think about human health, we can think about the dimension of time, too. Human diseases and conditions can be acute or chronic. Acute illness begins rapidly and lasts a short time, although in some cases it may leave a disability or long-term damage to the body. For instance, people who survived the infectious disease called smallpox were cured but often suffered disfiguring facial scars. Other examples of acute illnesses are pneumonia, measles, and poisonous snake bites. Chronic illnesses, on the other hand, usually begin slowly and go on for a long time, often for a lifetime. Diabetes mellitus, which results from the body's inability to handle sugar properly because of a lack of insulin, is an example of a chronic disease. Charles Dickens (1812-1870), one of England's greatest novelists, was fascinated by diseases. He studied them carefully, as a skilled physician would, in order to create unusual characters that were as realistic as possible. But Paul's head, which had been ailing more or less, and was sometimes heavy and painful, felt so uneasy that night, that he was obliged to support it on his hand.… But there seemed to be something the matter with the floor, for he couldn't stand upon it steadily; and with the walls, too, for they were inclined to turn round and round, and could only be stopped by being looked at very hard indeed. Poor little Paul Dombey dies at six years of age in the novel, and his story is especially poignant because it is so vivid. When Dickens himself died in 1870, a doctor wrote about him in the British Medical journal: "What a gain it would have been to physic if one so keen to observe and so facile to describe had devoted his powers to the medical art." Based on "Charles Dickens and the Art of Medicine" by Howard Markel, M.D., Ph.D., Annals of Internal Medicine (1984) 101:408-411. Because the body is a complex system, there are lots of ways in which things can go wrong—even though most of the time they do not. We can acquire conditions, such as alcoholic liver disease, or we can inherit them from our parents, such as hemophilia, a blood-clotting disorder. Malfunctions in any of our many body processes, like those caused by malnutrition or weakness in our body's defense systems, can leave us open to a variety of diseases and conditions, including diabetes and cancer. In Mark Twain's The Adventures of Tom Sawyer, Tom goes through a period of depression when his girlfriend Becky Thatcher becomes ill. Tom misses Becky at school and is afraid she might die. She had him out at daylight every morning, stood him up in the woodshed and drowned him with a deluge of cold water; then she scrubbed him down with a towel like a file, and so brought him to; then she rolled him up in a wet sheet and put him away under blankets till she sweated his soul clean and "the yellow stains of it came through his pores" — as Tom said. Tom had become indifferent to persecution by this time. This phase filled the old lady' heart with consternation. This indifference must be broken up at any cost. Now she heard of Pain-killer for the first time. She ordered a lot at once. She tasted it and was filled with gratitude. It was simply fire in liquid form. She dropped the water treatment and everything else, and pinned her faith to Pain-killer. She gave Tom a teaspoonful and watched with the deepest anxiety for the result. Her troubles were instantly at rest, her soul at peace again; for the "indifference" was broken up. The boy could not have shown a wilder, heartier interest if she had built a fire under him. Many diseases, including lethal diseases like smallpox, are infectious—that is, they can be spread from person to person. Conditions like Down syndrome and some forms of cerebral palsy are the result of something that goes wrong between the time of conception and the time of birth. Osteoarthritis and atherosclerosis are called degenerative diseases. Body parts just begin to wear out, malfunction, or fall apart, for reasons that are not always well understood. Sprains and broken bones, cuts, burns, stings, bites, and gunshot wounds are injuries to the body that can interfere with its structure or function. Most of the time, what makes a person seek medical care are symptoms, which are problems resulting from an illness that trouble the person who experiences them. On the other hand, what physicians and other clinicians look for are signs, known as markers of disease. For example, in Wilson's disease, which is caused by an accumulation of copper in the tissues, a patient may seek medical care because of tremor (shaking) in the hands or arms. Now, many things can cause tremor. But a telltale sign of Wilson's disease is a golden-brown ring around the iris of the eye that a doctor would know to look for. Symptoms usually are related to our ability to do things. They may reflect either acute or chronic problems. Bodily symptoms, such as a sore throat, swollen ankles, or aches, pains, and disabilities, may result from various kinds of problems in the body. Other symptoms, including common headaches or upset stomach, may be triggered by emotional, psychological, and interpersonal stresses. The name a clinician gives to a disease—the diagnosis—is important because it helps us understand how the disease is likely to affect the person and helps determine the kind of treatment the person should have. In reaching a diagnosis, a clinician will take a medical history, that is, listen to the patient's account of the problem. He or she will also perform a physical examination to look for signs. Based on what the examination shows or what the clinician suspects, laboratory tests may be ordered. These are tests to examine bodily fluids such as blood and urine. Special procedures such as x-rays and magnetic resonance imaging (MRI) scans provide views of bodily structures that are not otherwise accessible. Special tests such as renal clearance tests (to test kidney function) and glucose tolerance tests can tell whether various body processes are working properly. There are a variety of ways to provide relief from the diseases and conditions we encounter. In the best case, treatment seeks to cure the problem. If a cure is not possible, then the purpose of treatment is to control the symptoms and, if possible, to prevent worsening of the disease or condition. An important goal is to allow a person to carry out the activities of daily living as well and as free from discomfort as possible. X-rays or radiographs are high-energy electromagnetic radiation waves that come from radioactive substances such as uranium and radium, used to create images on photographic film. The part of the body to be x-rayed is placed between the photographic film and the radioactive source. A protective shield is removed from around the radioactive source for a short period of time and the x-rays pass through the body to the film. When the photographic film is developed, the images of the body show up in shades of gray: skin and soft tissues are darkest because the rays pass through them to the film; denser tissues like bone are lightest because they absorb the rays and prevent them from reaching the film. Discovered in 1895 by the German physicist Wilhelm Konrad Röntgen (1845-1923), x-rays still are one of the most widely used radiologic tools. CT scans are also called CAT scans, short for computerized axial tomography. CT scans show crosssectional planes of the body or parts of the body such as the head, chest, or abdomen. A tube-shaped scanner takes multiple x-rays of the body while the patient lies on a platform. Dyes sometimes are administered to highlight different blood vessels, tissues, or organs. The cross-sectional x-rays are enhanced by a computer, which puts together all the scanning data to create composite, three-dimensional images that are printed or displayed on a screen as visual "slices" of the body. Sonograms use sound waves to create pictures by bouncing the waves off tissues and converting the echoes into images. One of the most common types of sonography (ultrasound) is used to view a fetus during pregnancy. MRIs are short for nuclear magnetic resonance images. MRIs use magnetic and radio waves instead of x-rays to scan the body, often producing even clearer images than do CT scans. When magnetic and radio waves are sent into a specific part of the body, different types of atoms in the cells vibrate and emit unique radio waves. These emitted radio waves are detected and converted by a computer into an image that can be displayed on screen or printed out. MRI is useful for identifying abnormalities in soft tissues such as the brain, spinal cord, kidneys, urinary tract, pancreas, and liver. Laparoscopy is a procedure that uses a thin, lighted tube with a miniature camera to look inside the body. The patient remains awake but is given a local anesthetic to numb the part of the body being studied. The doctor inserts the laparoscope into the body through a very small incision and then views the camera images to guide the laparoscope. Other tools can be inserted through the same incision to take tissue samples for analysis in the laboratory or to remove tissue entirely. Usually, patients recover more quickly from laparoscopic surgery than from traditional surgery. The choice of treatment depends on the nature of the disease or condition. Surgery is a common form of treatment for removal of diseased organs and repair of malfunctioning ones, such as removing a diseased gallbladder or replacing a defective heart valve. Radiotherapy (the use of high-energy radio waves) is used to treat many forms of cancer. A change in diet is a feature of many treatment programs, depending on the disease; and other lifestyle changes may be required as well, for example, quitting smoking or increasing physical activity. Physical therapy is a staple of treatment for conditions that involve bones, muscles, and joints. Counseling and other psychological and psychiatric therapies may be recommended for emotional and mental disorders. Commonly, when we think of treatment, we think about the use of medications (drugs) manufactured by pharmaceutical companies. Of course, herbal remedies have been around for thousands of years too, and many of today's medications are derived from them. Before 1900, very few standardized, manufactured drugs were available to cure, control, or prevent disease, among them morphine for pain, digitalis for heart ailments, and vaccines for diphtheria and smallpox. But following World War II, many new drugs and classes of drugs began to be developed. Today, available drug treatments include antibiotics, anti-inflammatory drugs, hormonal treatments, cardiovascular drugs, immunosuppressive drugs, antipsychotic and antidepressant medicines, pain relievers, and chemotherapeutic agents for the treatment of cancer, to name just a few. In addition, a variety of nonprescription, over-the-counter medicines are available to treat minor illnesses. These medications have helped save countless numbers of lives and eased the symptoms of millions. Before the beginning of the twentieth century, even in the United States, state-of-the-art health care was something only the rich could afford. The poor often were left untreated or were admitted to the hospital, often to die. But beginning in the 1940s, good health came to be looked on more as a right than a privilege. Health insurance, medical research, and the expansion of hospitals were all products of this change in perspective, which was in part a result of the need to organize medical care for large numbers of troops during World War II. Another reason for the change in perspective was a shift in disease patterns. Until the beginning of the twentieth century, acute infectious diseases such as measles and smallpox were the prevailing afflictions of humankind. But beginning around 1900, improved sanitation, nutrition, and immunization made these diseases less common in the United States and the rest of the industrialized world. As a result, people began living longer—long enough for more of them to get the slowly developing diseases of age. In the industrialized world, chronic conditions came to dominate. And dealing with long-term continuous illness required a continuous system of care. The United States differs from other industrialized countries in that the health-care system evolved piece by piece, reflecting the country's traditional emphasis on a market economy, the reluctance of the government to control people's lives, and the role of interest groups. As a result, the kind of medical care people receive depends on a number of factors: personal choice, what kind of care is available, how much knowledge and information people have, what (if any) insurance they have to cover the cost of care, and how wealthy they are. Although "health care" and "medical care" are terms that deal with similar concerns, they differ in an important way. Health care is a more comprehensive term. It includes prevention—all the things someone can do to avoid disease—and health promotion—all the things someone can do to enhance fitness and well-being. Medical care, on the other hand, usually refers to the diagnosis and treatment of disease after it has developed. An effective health care system pays attention not only to curative medical services, but also to preventing disease and promoting health. By doing so, it may help large numbers of people who might not even realize the health care system has served them well. What Purpose Does Medical Research Serve? Effective medications and therapies often come after years of careful research and investigation. The process can be expensive and difficult. In the United States, the National Institutes of Health (NIH), the Centers for Disease Control and Prevention (CDC), and the Food and Drug Administration (FDA) represent a spectrum of government agencies whose priorities range from basic research in the laboratory, to monitoring and control of disease, to approval and regulation of new drug treatments. In addition, many private companies also do research on new treatment. An essential part of this process is what we call clinical trials—experimental tests of new drugs in patients. Because drugs can act so differently in people than in a test tube or in a lab mouse, medical research depends on clinical trials to move forward. Moreover, these trials are a required part of any application for Food and Drug Administration approval of new drugs. To a great extent, the longer life spans of the past century are due not just to the development of new medications or surgical techniques, but to important public health measures such as improved sanitation, immunization programs, and the availability of bacteria-free drinking water. Toilets and drinkable water are something we tend to take for granted, but they have improved the health of more people than any "miracle" drug. Unfortunately, such advances have not been universal. In many parts of the world—particularly in poor or developing nations of Africa and Asia—many people live crowded together without enough nutritious food to eat, clean water to drink, or sanitary systems to dispose safely of human waste. To make matters worse, the warm, moist climate in these areas makes it easy for many disease-causing parasites and bacteria to grow and spread. Nations and individuals may lack the money needed to prevent diseases and pay for medical care, especially up-to-date diagnostic equipment, antibiotics, and other drugs. As a result, acute infectious diseases that are rare in the United States still take a huge toll in death and illness, especially among children in impoverished parts of the world. Tylenol® and acetaminophen (a-set-a-MIno-fen) are pain medications that can be bought over the counter without a prescription. Which is better for mild muscle aches or headaches? The answer: they are the same drug. Drugs often have three or more names: a brand name, a generic name, and a chemical name. The pharmaceutical company that applies for a drug patent often gives the drug its generic name (acetaminophen) and then patents a brand name, in this case Tylenol®. When a company develops a new drug, it must spend a lot of money on research, development, and clinical trials to test the drug's safety and effectiveness on volunteers. If the drug proves to be safe and effective, then the U.S. Food and Drug Administration can approve it for sale. To protect its investment, the drug company files a patent to protect the drug from competition. During the patent period, usually seven years, the patent holder is the only company that can sell the drug. During this time, people who buy the drug are not paying justforthe drug itself; they also are paying for the development, testing, and approval. After the patent expires, competing companies may manufacture and market the same drug under its generic name, but they may not use its brand name. Generic drugs cost less because the companies that manufacture them do not need to spend nearly as much money on developing and testing the drug. Drugs also have a third name, the chemical name. Chemical names usually are used only by chemists, because they are long and hard to pronounce. The chemical name forthe active ingredient in Tylenol® and acetaminophen is N-(4-hydroxyphenyl) acetamide. So which is better for mild muscle aches or headaches? In this case, both may do nicely. But be sure to check with a doctor. All drugs can be dangerous if not used correctly. We know the value of health by what is taken away from us when we do not have it. Health problems can affect our ability to move freely, to work, to create, to play, to enjoy food and life's other pleasures, to be able to remember things, and to have family and friends. To be denied any one of these capacities can lessen the quality of life. Yet sickness is a part of life—something that happens to us—like being born, falling in love, or growing old. Our illnesses, or those of people we care about, are unavoidable elements of our day-today living. To the extent that we are healthy, we have an enhanced capacity for living. But having a disease or condition does not mean that we have to be miserable. It is not the perfection of individual body parts but what a person brings to a life that matters. It is possible to have a disease and to be happy and productive, or to have a condition and to be otherwise healthy. Apart from the care and treatment we receive from the medical establishment, how we respond to challenges to our physical well being depends most on our individual constitution and outlook, and on support from family, friends, and community. We are fortunate to live in times when there are many things people can do to prevent or control certain kinds of illness and chronic conditions. We can help to keep ourselves and our children healthy by making sure we get vaccination shots, by shunning tobacco products and other substances of abuse, by getting enough physical exercise, and by eating nutritious foods in proper amounts. As we become adults, having screening tests for some of the more treatable forms of cancer, such as breast cancer and colorectal cancer, and tests for diabetes can help to catch diseases early, so that even if we do become ill, the disease will have less of a chance to damage or disable us. Chronic diseases can be prevented and sometimes controlled by a variety of measures. For instance, a person with emphysema can keep the condition from getting worse by stopping smoking; patients with early alcoholic liver disease or pancreatitis can limit their illness if they stop drinking. Attention to safety can help to prevent many accidents, and injuries from certain kinds of accidents can be minimized, for example, by wearing seatbelts (in cars) and helmets (when riding bicycles or driving motorcycles or skating). To an increasing extent, in fact, we are responsible for safeguarding our own health. But we depend on society to give us access to the educational and professional services we need. It also is important to remember that while our actions can make illness more or less likely, we cannot fully control whether we stay healthy or not. Sometimes people blame themselves for getting sick, as if they had somehow failed. Or they may feel guilty if their illness upsets their family or friends. But nobody wants to get sick, and nobody should be blamed for becoming ill.
What scientific evidence exists that the treatment is safe and effective? How many visits does the treatment require? How long before the treatment results in improved health? Could this treatment interfere with conventional medical care? Could this supplement interfere with prescription medications? Is the alternative practitioner willing to discuss the complementary treatment plan with the primary physician? support groups for patients and caregivers. In cases of severely debilitating illness, such as alcoholism or Alzheimer's disease or cerebral palsy, the family can be affected by the disease almost as much as the patient. No one should hesitate to ask for help. For example, a database called the Adaptive Device Locator System (ADLS-on-the-Web) is available on the Internet to help people find assistive technology—anything from motorized wheelchairs to specially crafted cups to make activities of daily living, such as eating and recreation, easier. To make sure that the rights of those with disabilities are protected, in 1990, the U.S. Congress passed the Americans with Disabilities Act, which prohibits discrimination against people with disabilities (physical or mental impairment) in employment, housing, education, and access to public services. There are said to be many thousands of human diseases and conditions. We editors who are physicians have seen quite a few of them, but certainly not all! We have chosen about 300 of them to include in these volumes for a variety of reasons. Some are very common. Others, while uncommon, have an important place in the history of humanity. Still others may be worrisome—so it is good to know the real facts about them. Some diseases and conditions are particularly interesting, or teach us something special. When we talk about health we also mean mental health, of course, and a number of the sections deal with this important area. Most of the editors of this encyclopedia are doctors who particularly enjoy—and are experienced in—teaching and writing about health issues. Others of us are professional health writers and editors. We hope you enjoy using the encyclopedia as much as we enjoyed working on it. KidsHealth.org . This website, supervised by the pediatric medical experts at the Alfred I. duPont Hospital for Children, offers articles, animations, and games about health. U.S. National Institutes of Health (NIH). This is the government agency that oversees most medical research in the United States. The search engine at its website can locate information about clinical trials and fact sheets about many of the diseases and conditions described in this encyclopedia. U.S. Centers for Disease Control and Prevention (CDC). This is the government agency that tracks statistics about illnesses and deaths in the United States, posts notices about diseases for travelers, and assists local governments during medical emergencies. U.S. Food and Drug Administration (FDA). This is the government agency that monitors food and drug safety. Americans with Disabilities Act (1990). Maintained by the U.S. Department of Justice (DOJ), the ADA home page has a search engine and an ADA information line. World Health Organization (WHO). This is the branch of the United Nations that tracks health and disease worldwide.